I’ve taken Rami’s good advice to create a whole new mystery as the central plot in this TV pilot. I’ve picked Philip Snowden, 1st Viscount and member of the privy council as my mark, specifically that his life is being threatened due to his stance against government relief during the Great Depression. Stay tuned for more spoilers! From Shakespeare’s Merchant of Venice, Nerissa is Portia’s lady-in-waiting and confidante. She marries Gratiano and escorts Portia on Portia’s trip to Venice by disguising herself as her law clerk. 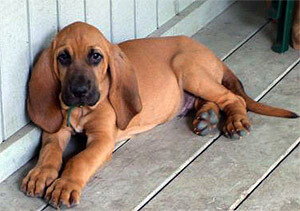 She is also Portia Adam’s new Bloodhound puppy.